You’re good all week, eating healthy food, having alcohol-free days and exercising. Then (thank God) Friday comes along. Time to hit the pub with friends, indulge in pizza for dinner or have a few wines while watching a movie. Saturday morning arrives and you may go to the gym followed by a huge brunch at your favourite cafe and maybe a slice of cheesecake. By Monday morning you’re feeling sluggish, tired guilty and like you’ve gone backwards. Most people want to let loose and unwind on the weekend, especially if they’ve been doing so well during the week. It’s a reward and a way to start relaxing. Let’s face, it’s about having fun in the moment. But the guilt, anger and regret that come at the end of the weekend isn’t helpful. So, what can we do to still enjoy the weekends without feeling like we’ve taken 5 steps back? Most of us are unconsciously dictated by what day it is and this could be the answer to the weekend bingeing. If you are striving for perfection on Monday, Tuesday and Wednesday then you are relying a lot on willpower. Willpower is like fuel in a car, it can run out the more you drive the car. Then you relax a bit on Thursday (afterall, Friday is looming) then let loose Friday, Saturday, Sunday because you have no willpower left so it’s all systems go! What if you didn’t strive to be perfect during the week? This is the thinking behind our 80/20 days. You don’t have to be perfect. Eat real, healthy food 80% of the time, but if you do fancy a glass of wine with dinner or a bowl of ice-cream after dinner, then count that as your 20%. The only rule is you don’t go beyond that 20% and have the wine and the ice-cream. Trade one thing off for another. Choose your daily treat wisely, have the best quality you can afford and really enjoy it. If you take being ‘perfect’ out of the equation, it relieves the pressure and the need for willpower. Our approach allows you to set your own food rules based on the 80/20 approach, so food choices aren’t difficult and best of all, there aren’t any ‘cheat days’ because you are giving yourself permission to indulge in that 20% if you want it. This approach also allows you to be in charge of your own choices, providing they are within the 80/20 range. If your weekend indulges are working for you, of course keep going. You know yourself what works for you. But if you find you’re feeling conflicted and don’t enjoy the feeling at the end of the weekend, you can experiment with the 80/20 approach during the week and see how that affects your weekend. The research is showing if you practise these 3 things everyday for 21 days it will improve your happiness. Sounds simple! Although these tools are the focus of his talks, he did say they will not work without exercise, good nutrition and sleep – so in this blog we’ll explore why that is. Moving your body a lot (whether it’s sport or walking the dog) will release feel-good chemicals (hormones) in your body called endorphins. You want endorphins because they make you feel happy and relaxed. Exercise also releases other chemicals important for mood and motivation, called serotonin and dopamine – and if that’s not enough, it releases growth factors which help your brain to grow and adapt (a process known as neuroplasticity). Conversely, sitting for hours on end, on computer games, or computer or watching TV makes most people feel tired and grumpy and is disruptive to our brain chemistry. Having a few treats every now can make us feel happy, but when we have too many it can affect our mood. There is a connection between what you eat and how you feel. Research is showing that if you eat lots of fruit, vegetables and whole-grains it can boost your mood. Eating loads of sugar and processed food (ie ‘junk food’) may cause your mood to decline. Although it’s complex, this could be related to the link between our gut and the brain (called the gut-brain axis) – for example, over 90 percent of the mood enhancing neurotransmitter serotonin is produced in our gut and not our brain. If our gut isn’t happy, it sends messages up to the brain and in turn affects our mood. Sleep is as important as nutrition and exercise. Nothing good comes from not getting enough sleep. Sleep affects mood, learning and behaviour. It also helps us get better if we’re sick. When we’re sick, sleep produces infection-fighting proteins called cytokines, which also make us feel sleepy. That’s why when we’re not feeling well, we also feel tired. It’s our body telling us to rest. Sleep is also the time when our brains flush out toxins and repair and strengthen our brain cells. It’s like sleep is the time our brains take out the rubbish. So, in summary – practising gratitude, mindfulness and empathy along with eating well, moving a lot and getting a good night’s sleep are the keys to a healthy, happy life. When you’re working a shift-schedule or working late nights, your physical activity, sleep and diet habits can really suffer. People who work shifts may find it hard to keep up a regular exercise and sleep schedule, putting shift workers at higher risk of weight gain, and all sorts of health disorders, from heart disease to cancer (National Sleep Foundation). No matter how busy your schedule may seem, even small bursts of physical activity will be beneficial to your health. Not only can it help improve your fitness and sleep, but also decrease your risk of disease and make you feel better. Here are some tips to make it easier for you to stay active even with an irregular or shift work schedule. Try to take walks before or after work, or even during your breaks. This is a soothing activity which can help with not only your physical health but also your mental health. If you’ve been standing for long periods of time; get up and move, whether it’s a light stretch or some short spurts of movement, such as push-ups or some squats. 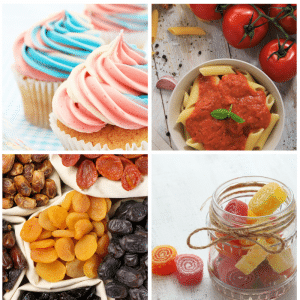 Read our blog post on Movement Snacks for more ideas. We take the lift or escalator without thinking but if it’s just a few floors – really make an effort to take the stairs whenever you can. If you drive, park further away so you have to walk more. If you take Public Transport, get off a stop or two early. If you do have time to workout, try doing it before work as it’s likely you’ll be too tired afterwards. This will give you a sense of accomplishment before your day/night begins and give you some energy to get through your shift. Keep a pair of light weights, a stability ball or resistance bands at your desk and try to use them for at least 10 minutes during your breaks or throughout your shift. Find a gym that offers 24-hour access so that you can go whenever it suits you. Try short sharp bursts of exercise over long workouts which might be hard to squeeze in for those of you working longer shifts. Log-in to Ritualize to try our 7-minute workouts. It’s important to remember that every little bit of movement counts! The sleep-wake cycle appears to have evolved for humans to be awake during the day and to sleep for approximately eight hours at night. There is a small part of the brain called the ‘circadian clock’, which monitors the amount of light you see, so in the evening, when the light starts to wane, your clock notices and prompts a flood of a brain chemical called melatonin, which gives the body the signal to fall asleep. Overnight, melatonin levels remain high. They drop at daybreak and remain low during the day. A person working the night shift, which causes disruption to the circadian rhythm, is at greater risk of various disorders, accidents and misfortunes. So if you’re a shift-worker or regularly working late, what can you do to help improve your sleep? Try not to work a number of night shifts in a row. You may become increasingly more sleep-deprived over several nights on the job. You’re more likely to recover if you can limit night shifts and schedule days off in between. Avoid frequently rotating shifts. If you can’t, it’s easier to adjust to a schedule that rotates from day shift to evening to night rather than the reverse order. Keep your workplace brightly lighted to keep yourself alert. 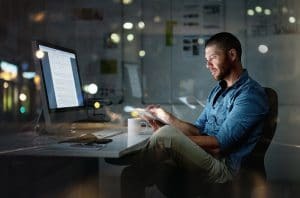 If you’re working the night shift, expose yourself to bright light when you wake up, such as that from special light boxes, lamps, and visors designed for people with circadian-related sleep problems, Being exposed to bright light when you start your ‘day’ can help train your body’s internal clock to adjust. Limit your caffeine intake. Drinking a cup of coffee at the beginning of your shift will help promote alertness, but don’t consume caffeine later in the shift or you may have trouble falling asleep when you get home. Avoid bright light on the way home from work, which will make it easier for you to fall asleep once you hit the pillow. Wear dark, wraparound sunglasses and a hat to shield yourself from sunlight. Don’t stop to run errands, tempting as that may be. Use blackout blinds or heavy curtains to block sunlight when you sleep during the day. Even if your eyes are closed, the sunlight coming into the room tells your brain that it’s daytime, and that can really impact your ability to sleep and stay asleep for the time that you need. Try Box Breathing to help unwind after shifts. It is a simple technique to help you manage stress, calm your nerves, reduce anxiety and can improve your sleep. Check out our tutorials and a series of guided breathing sessions. Eat your “main meal” before going to work, as eating large meals during the night can cause heartburn, gas, or constipation. Then have smaller meals and healthy snacks during your shift and before bed. Have a light snack before bedtime. It’s hard to fall asleep when you’re too hungry or too full. If you’re still hungry after work, eat a small healthy snack before bedtime. Try a bowl of whole grain cereal with milk or a piece of whole grain toast with jam. If you’re too full at bedtime try cutting out a snack during your shift. Pack your own healthy snacks. It can be difficult to find healthy snacks during the afternoon and night shifts. The cafeteria may be closed. Vending machines may only carry salty or high-fat snacks and high-calorie sugary drinks. Examples of good snacks are an apple, a banana or a handful of nuts with low in sugar yoghurt. Avoid fatty, fried or spicy foods. Foods such as hamburgers, fried chicken and spicy chilli may lead to heartburn and indigestion. Eating too much processed and trans fat can also increase your risk of heart disease and type 2 diabetes. For information on healthy fats, check out our blog post. Avoid fast food, no matter how easy and accessible it is. Try to meal prep at the start of each week, if you’re finding it difficult to prepare healthy food every day. Avoid sugary foods and drinks. You may feel a quick boost of energy after having a chocolate bar or sugary soft drink. This feeling doesn’t last long and you may experience low energy levels later on. Enjoy nutritious snacks and beverages instead to stay alert and keep your energy up. Take your time eating. Don’t rush when you eat. You deserve your break, so enjoy every single bite of your meals and snack! If possible, eat with your co-workers for some company. Stay well hydrated. Drink plenty of water to prevent dehydration. It may help you to stay alert and not feel so tired during your shift. Keep a water bottle nearby and take sips even before you feel thirsty. Low-fat milk, tea or herbal tea are other nutritious beverages that you can drink. Watch the amount of 100% fruit juice you drink because the calories can add up quickly. Avoid alcohol after work and when you get home. A drink may make you feel more relaxed, but alcohol can disturb your sleep. The only fructose in the diet of our caveman ancestors was in the limited supply of honey, berries and other seasonal fruits. Today, the majority of our fructose consumption doesn’t come from fruit. It comes from the processed, convenience foods we have at our fingertips. Things like breakfast cereals, yogurt, soft-drinks, sports drinks, cakes, sweets, biscuits, store-bought pasta sauce and tomato sauce (and that’s just scratching the surface). It’s hard to avoid! The association between sugar, obesity and disease is supported by the high intakes of sugar which health surveys are indicating. Whether fructose is the cause of this or just one of the factors of lifestyle choice, is debatable. However, it’s certainly not helping and that is something that can’t be argued. So, what’s the issue with fructose? To start with, a small amount of fructose is metabolised in the liver and is eventually stored as liver glycogen for energy, which is great if you’re very active. The problem is, most of us aren’t having a small amount so the liver ends up converting it to fat. Not only do high levels of fructose lead to the synthesis of fat, they also fail to stimulate the hormone Leptin, which is responsible for sending messages to the brain that we’ve eaten enough and feel full. This means eating a high fructose diet can lead to overeating because, despite the amount we’re consuming, we don’t feel full and will end up overeating. With the media focus on fructose, many fad diets and so-called ‘experts’ have demonised fruit due to the fructose they contain. It’s important not to mistake low levels of fructose as the problem as it’s high levels that the liver can’t handle. Unless your body has problems absorbing fructose, eating 1-2 whole, fresh fruit each day is an important source of fibre, vitamins and minerals the body needs. Does that include fruit juice? So many of us grew up starting the day with a glass of orange juice and many are now offering the same to their kids under the guise of it being healthy. A glass of juice may offer vitamins, but through processing the fruit to juice, the majority of fibre is extracted and what you are left with is a glass of fructose. With its high levels of fructose, fruit juice is a treat food. Smoothies use the whole fruit, so are a better source of fruit than juicing. Many people now process the whole fruit with a bit of water to enjoy a glass of juice. Which foods contain the highest and lowest amounts of fructose? A good source of guidance on the foods that are highest and lowest in fructose can be found at this site: www.food-intolerance-network.com. As this site points out, however, some foods that are high in fructose can generally be tolerated better than others, partly due to the amount of glucose and other nutrients it is combined with. 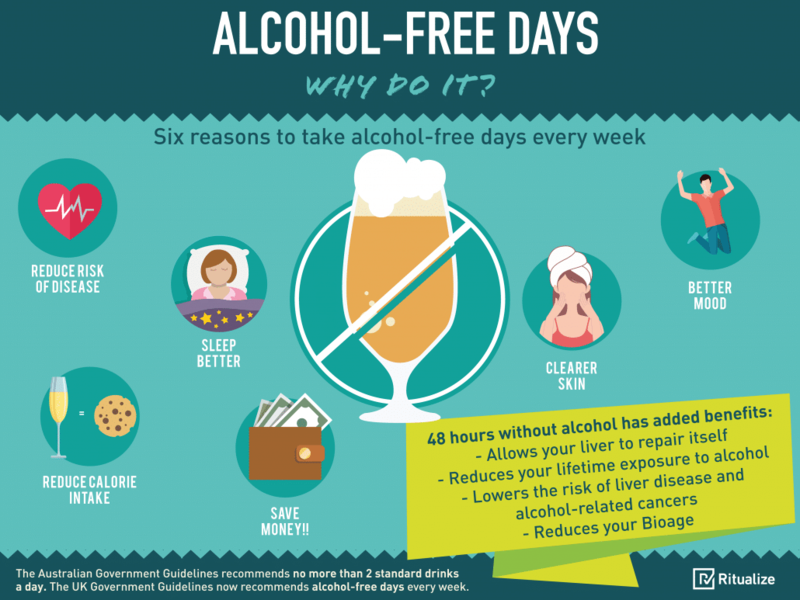 Alcohol Free Days – Why Do It? It’s very common for people to wind down after work with a drink. 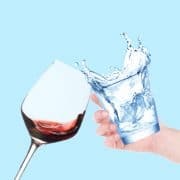 This may seem harmless enough, but the reality is that half of that bottle of wine or those few bottles of beer could be causing silent damage to your liver, with serious consequences. It may surprise you to know that the majority of people who die from the alcohol-related liver disease are not alcoholics. Alcohol causes damage to the cells in your liver, which can lead to inflammation and scarring as it tries to repair itself. Even if you only have one or two drinks a day, your liver can’t cope and can’t repair itself, but you don’t have to become a ‘tea-totaller’ to fix it. Your liver needs at least 48 hours without alcohol to repair itself. Cutting back your daily intake won’t help your liver. The 2 days have to be alcohol-free and it’s important they are ‘consecutive’. At Ritualize, we include an Alcohol-Free Day on our Ritual lists. By adding it to your personal Rituals, you’ll be giving your liver a break and bringing your BioAge down. Alcohol over time can cause also cause brain damage, heart disease, high blood pressure and increase your risk of many cancers such as breast cancer, mouth and intestinal cancers. Your quality of sleep will improve. Alcohol also blocks your rapid eye movement (REM) sleep which is imperative for growth and repair. Less REM sleep can cause you to be tired and lack in focus the next day. Alcohol contains empty calories, which means you are taking in calories that your body doesn’t need. A glass of wine can contain 120 calories and a beer about 150 calories. When you have a break from alcohol, you not only cut down on these empty calories, but you tend to make healthier food choices. Alcohol dehydrates you, which can dry your skin and over time cause you to look older than you are. The increase in blood flow can cause a red pigmentation. You may feel happier while you’re drinking, but the next day alcohol can make you feel down. This is because alcohol is a depressant and affects the balance of hormones in the brain. Having a few Alcohol-free days can make you feel a lot brighter. It’s always advisable to drink alcohol in moderation on the days you do drink and know that you and your liver will enjoy your 48 hours without it. Make it a weekly ritual and reap the benefits. https://ritualize.com/wp-content/uploads/2018/02/AFD.jpg 800 800 Courtenay Fairhurst https://ritualize.com/main/wp-content/uploads/2017/03/Logo_smaller.png Courtenay Fairhurst2018-02-25 16:58:232018-05-02 11:45:29Alcohol Free Days - Why Do It? Calories are often at the centre of our decision as to whether or not to eat a certain food. Many of us are counting our calories and many weight loss programs require you to do the same, but is it an effective long-term strategy? It’s very time consuming, and not a realistic long-term strategy for most people. Manufacturers are allowed up to 10% leeway when estimating calories in their products, so you may be eating more or less than you think. Calorie amounts found on food labels are based on something called the Atwater system, which basically involves estimating the energy of foods by measuring the heat given off when it is burned. However, the accuracy of the system is strongly disputed – for example, a 2012 study by a USDA scientist concluded that the measured energy content of a sample of almonds was 32% lower than the estimated Atwater value. Furthermore, it is known that some calories are lost in waste, without ever having been chemically converted or stored. It is really just generally accepted as true because there is no better way to estimate calories from food at this point. Calories from different foods are not all equal. Professor Robert Lustig carried out a study. For example, you could eat a doughnut which is around 240 calories. The same calories are in a cup of avocado. One is a highly processed food and the other is picked off a tree. 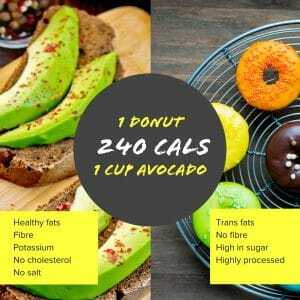 Same calories, same effect? Absolutely not. With that in mind, let’s look at some examples of how the body breaks down, metabolises and uses food. The food contains the macronutrients fibre, protein, fat and carbohydrates. Nuts are high in fibre and there is some research to say that lean, healthy people tend to eat a lot of them. How can this happen given they’re high in calories? Let’s say you eat 160 calories in almonds. Because of the fibre in the almonds, some good things happen. First, the fibre keeps your blood sugar from rising too high, which keeps your insulin down. Secondly, the fibre bypasses the small intestine and goes intact to the large intestine and the good bacteria living there end up chewing it up instead of you absorbing them. So, even if 160 calories entered your mouth, only around 80% of those are actually available for you to absorb. This is because not all calories are created equal. Digestion of food requires energy to create energy. This is called the thermic effect of food and protein requires over twice the energy to digest it if you compare it to fat and carbs. Next, let’s look at the demonised fat. There are good fats and there are bad fats. Some fats are incredibly good for you and others will, over time, make you sick. Good fats are like omega 3s of salmon, flaxseed and walnuts or monounsaturated fat from avocado. Bad fats include trans fats which are found in many processed foods and junk food. Calories from fat are not all equal either. Let’s look at carbohydrates. Like fat, there are good carbs and there are bad carbs. Like fat, there are good carbs and there are bad carbs. Good carbs from real, unprocessed food such as vegetables, legumes, fruit and whole-grains which are high in fibre. Refined carbohydrate is found in processed food, which is low in fibre. This is the reason the current western diet is low in fibre, which is a major factor as to why people are getting sick. 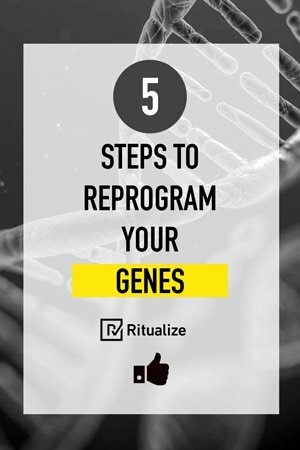 Ritualize has a simple approach to nutrition – we call it the 80/20 Lifestyle where 80% of your daily food intake is from real, whole food that was recently alive and 20% is your treat food. This approach means you don’t feel deprived, but maintain control of the treat food while getting all the nourishment your body needs to stay healthy. Awareness Start thinking about your everyday lifestyle and how your genes may be responding to it. 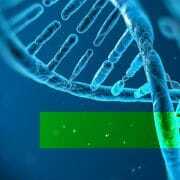 Each day your genes will respond positively or negatively depending on how you are living your life. Exercise – The activity level of skeletal muscle modulates a range of genes that produce dramatic molecular changes, and keep us healthy (Neufer & Booth, 2005). Even one single vigorous workout can set off a chain reaction of health benefits through activation of key genes. Exercise can suppress the expression of genes that contribute to chronic diseases, whilst up-regulating healthy gene expression almost immediately. So, next time you’re sweating it out in a workout, know you are having a positive effect on your genes. It may be the motivation you need to go that extra mile! Nutrition Studies have shown that different intakes of food can affect your gene expression through a process called methylation. Methylation reactions are critical for many bodily functions and need significant amounts of methyl groups from food to function optimally. We have known for many years that certain foods which are high in B vitamins help with methylation, such as cooked vegetables (especially green vegetables & beets), unprocessed meats and quinoa – but we also need other foods to make up a healthy, balanced diet. 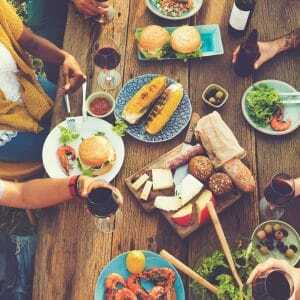 Recent research from the University of Science and Technology in Norway has shed light on the gene, expressing effects of certain types of diet. “We have found that a diet with 65% carbohydrates, which often is what the average Norwegian eats in some meals, causes a number of classes of genes to work overtime,” says Berit Johansen, a professor of biology at NTNU. This has significant implications for people who follow recommended dietary guidelines and eat a diet that has 55-65% calories from carbohydrate. “Genes that are involved in type 2 diabetes, cardiovascular disease, Alzheimer’s disease and some forms of cancer respond to diet, and are up-regulated, or activated, by a carbohydrate-rich diet,” says Johansen. The Ritualize 80/20 food pyramid will give you a great balanced diet that is lower in carbohydrate and higher in fat and protein than traditional government guidelines. Eat plenty of fresh, locally grown vegetables and a moderate amount of fruit, as well as grass fed, free range meat and chicken, sustainable fish, legumes, nuts and seeds and drink plenty of water. 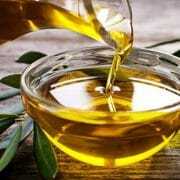 Most of your fat should come from extra virgin olive oil and avocado, with moderate amounts of coconut oil, dairy and other animal fats as well as minimal amounts of processed fats and commercial vegetable oils. The big key is to avoid processed foods and eat mostly stuff that has been alive. Home cooking is always the best, but for the time poor, there are more and healthier choices in supermarkets and grocery shops for a quick, easy meal. Stress – we have known for many years that chronic stress can have detrimental effects on your health, and we now know the biochemical pathways behind such negative effects. Even negative thoughts can stimulate the production of genes that increase our chances of chronic disease, but we need to understand the ‘Goldilocks effect’ of stress – we need a certain amount of stress to stimulate us and help us to adapt. This process is known as ‘hormesis’ and enables us to develop stress resistance. Just like an athlete can either under-train or over-train, we can get too little or too much stress. Athletes optimise their training by paying close attention to volume, intensity and duration, and so should we. During a period of prolonged and more intense stress, our recovery needs to be optimal – just like an athlete. Psychosocial – a number of other areas are emerging that can affect gene expression. We know that being socially isolated or rejected can up-regulate genes involved in dangerous metabolic inflammation, but being socially connected can have a positive effect on our wellbeing. 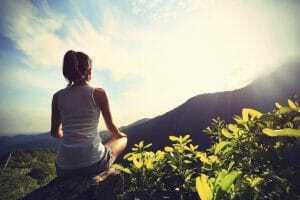 Meditation has recently been found to suppress inflammatory genes and can even increase grey matter density and the practice of gratitude can enhance your mood and wellbeing. 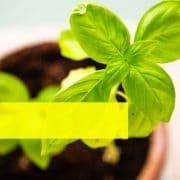 Doing a daily gratitude ritual, practising a few 1-minute meditations throughout the day and taking time to connect socially will pay huge dividends over time. The bottom line is that a range of interacting lifestyle behaviours affects our gene expression and our overall health. Eating well will give you the energy to exercise and exercising regularly will help you to manage stress and enhance your focus, as will regular 1-minute meditations and a daily gratitude ritual. This will put you in the right frame of mind to cultivate social relationships, which will make you more positive – a very positive lifestyle loop! Adding herbs and spices to your dishes is not just about flavour. There are a host of nutritional benefits and it’s a good idea to include them in your diet each day. Basil is one such example. It evokes the aroma’s of Italian sauces and adds a perfect pop to a pizza. It’s also really good for you. 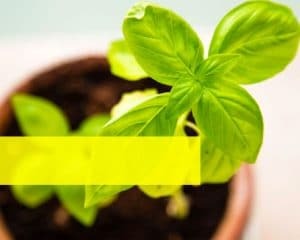 One benefit is its anti-bacterial qualities, so much so that food scientists are currently looking at using basil oil in food packaging that will act as an antimicrobial agent, inhibiting the growth of food-borne bacteria. Another benefit is its anti-inflammatory properties, but what does this mean? In general, eating food that inhibits inflammation is about reducing your risk of many preventable diseases in later life and improving your overall health. It’s about using food as part of a disease prevention plan. Basil has an active ingredient called Eugenol which has anti-inflammatory properties, so it can help reduce the risk of cancer and diabetes. It also is a great source of vitamin K (a nutrient important for bone health) and a ¼ cup delivers nearly a 3rd of your daily intake. A great way to get plenty of basil into your diet is by adding pesto to your meals. Add it to fish or chicken, stir in pasta, add to tomato and serve on toast or add it your pizza. Yum! Don’t refrigerate your basil. Store at room temperature in a glass of water. It’s best used on the day of purchase, as it wilts very quickly and gets depleted of nutrients. If you have any left over, simply process with a bit of olive oil and freeze it in an ice-cube tray. Better still, grow your own so you only pick what you need. Basil evokes aroma’s of fresh Italian dishes and can be eaten cooked or raw. Not only is it delicious, it’s also incredibly healthy. Read about the health benefits of basil here and enjoy this simple pesto recipe. Combine all ingredients (except the cheese, salt and pepper) in a food processor or blender and whizz to a smooth paste. Including loads of vegetables in your diet is so important for your health. Vegetables are incredibly rich in nutrients and antioxidants, which boost your health and help fight off disease. Additionally, they are good for weight control as they have a low-calorie content. Getting the required several serves of vegetables can be hard for some people.Some simply don’t like them while others are unsure how to prepare them so they taste good.Here are some unique ways you can incorporate vegetables into your diet so that you never get sick of eating them. Soups are a great way to eat multiple servings of vegetables at once. You can make veggies the “base” by pureeing them and adding spices. You can also simple cook veggies in broth or cream-based soups. Adding even a small amount of extra veggies, such as broccoli, to soups is a great way to increase your intake of fibre, vitamins and minerals. Try this easy Carrot and Ginger soup. Another creative way to eat more veggies is by making zucchini lasagna. Traditional lasagna is a pasta-based dish made by layering lasagna sheets with sauce, cheese and meat. It’s tasty, but it’s also typically very high in processed carbs. A great way to prepare this delicious dish so that it has a lower carb content and more nutrients are to replace the lasagna noodles with strips of zucchini. Zucchini is a rich source of B vitamins and vitamin C, in addition, to trace minerals and fibre. Veggie noodles are easy to make, and a great way to get more veggies in your diet. They’re also an excellent low-carb substitute for high-carb foods, such as pasta. They are made by inserting vegetables into a spiralizer, which processes them into noodle-like shapes. You can use a spiralizer for almost any type of vegetable. They are commonly used for zucchini, carrots and sweet potatoes. Once the “noodles” are made, they can be eaten just like pasta and combined with sauces, other vegetables or meat. Try this Pesto Zucchini Noodles with Prawns. Adding extra vegetables to your sauces is a sneaky way to increase your veggie intake. While you are cooking the sauce, such as a bolognese sauce, simply add some veggies of your choice to the mix, such as chopped onions, carrots, spinach or capsicum (peppers). You can also puree certain veggies with seasonings and make them into a sauce on their own. Cauliflower is extremely versatile, and there are many unique ways to include it in your diet. One strategy is to replace regular, flour-based pizza crust with a cauliflower crust, which is made by combining cauliflower with eggs and almond flour and some seasonings. You can then add your own toppings, such as fresh veggies, tomato sauce and cheese. Substituting cauliflower crust for flour-based crusts is an excellent way to enjoy the delicious taste of pizza while increasing your nutrient intake. A cup (100 grams) of cauliflower contains only 5 grams of carbs and 25 calories, in addition to lots of fibre, vitamins, minerals and antioxidants, which flour-based crusts lack. Smoothies are great for breakfast or a snack. Typically, they are made by combining fruit with ice, milk or water in a blender. However, you can also add veggies to smoothies without compromising the flavour. Fresh, leafy greens such as kale and spinach are common smoothie additions and a great way to get a serving of vegetables. 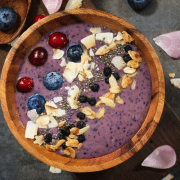 Try this Breakfast Berry Smoothie. Just 1 cup (30 grams) of spinach contains 181% of your daily needs for vitamin K and 56% for vitamin A. 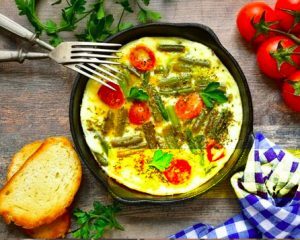 The same serving of kale provides 206% of your daily needs for vitamin A, 134% for vitamin C and 684% for vitamin K.
Including extra veggies in casseroles is another great way to increase your veggie intake. Casseroles are a dish that combines pieces of meat with chopped vegetables and often potatoes. In the western world, we tend not to think of eating vegetables for breakfast. However, there are opportunities. 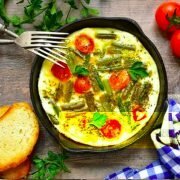 Heating left-over veggies and pouring in some beaten eggs is a tasty, nutrient dense breakfast. Find the recipe here. Using lettuce as a wrap or certain veggies as buns in place of bread is an easy way to eat more veggies. Lettuce wraps can be a part of several types of dishes and are often used to make low-carb sandwiches and bunless burgers. Additionally, many types of veggies, such as portobello mushroom caps, sliced sweet potatoes and sliced eggplant make excellent buns. 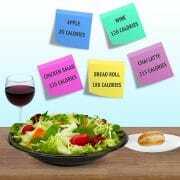 Lettuce wraps and veggie buns are an easy way to reduce your calorie intake while providing you with extra nutrients. Veggie kebabs are a great dish to try if you want to increase your veggie intake. To make them, place chopped vegetables of your choice on a skewer and cook on a grill or barbecue. Capsicum, onions and tomatoes work well for kebabs. You can also use mushrooms and zucchini. Adding veggies to tuna salad is a great way to incorporate more vegetables into your diet. Try this Tune and Rice Salad. Stuffed capsicum is an easy and excellent dish to include in your diet if you want to increase your veggie intake. They are made by stuffing halved capsicum with cooked meat, beans, rice and seasonings and then baking them in the oven. Capsicums are a rich source of many vitamins and minerals, especially vitamin A and C. You can increase the nutrition content of capsicum by including lots of extra veggies. Onions, spinach or cauliflower all work well. It is fairly easy to add veggies to guacamole and makes for a unique way to increase your veggie intake. Guacamole is an avocado-based dip made by mashing ripe avocado and sea salt together with lemon or lime juice, garlic and additional seasonings. Try this Easy Guacamole recipe. A variety of vegetables taste great when incorporated into guacamole. Capsicum, tomatoes and onions are good options. You can also make guacamole with roasted vegetables. A unique way to increase your veggie intake is by eating cauliflower rice. It is made by pulsing cauliflower florets in a food processor into small granules. You can then use it raw or cooked as a substitute for rice. This Cauliflower Fried Rice is delicious. Even the kids will love it! Cauliflower is significantly higher in nutrients than rice. It is particularly high in vitamin C, vitamin K, folate and potassium. There are many unique ways you can include more vegetables in your diet. Make “rice” and “buns” with vegetables, or incorporate them into common dishes, such as casseroles and soups. By making veggies a regular part of your food intake, you’ll significantly increase your intake of fibre, nutrients and antioxidants. Eating enough vegetables is also linked with a reduced risk of heart disease and cancer, and may be beneficial for keeping your weight under control. At the end of the day, you can’t go wrong eating more veggies. We know the amazing benefits of Extra Virgin Olive Oil (EVOO), such as a huge array of beneficial polyphenols and fats that are good for your heart and brain. EVOO also has a high smoke point, so you can fry and bake with it unless you’re cooking at very high temperatures (such as deep frying). However – you may be surprised to know that know not all are created equal. When it comes to EVOO, you don’t always get what the label says. There are beautiful EVOOs available in Southern Europe, but most of them don’t make it to Australia, and many export oils have been mixed with normal olive oil or even canola oil. In addition, many small growers from the Mediterranean, who may have processed and bottled the olive oil themselves in the past, are now sending their olives off-site to a pressing plant. This means olives may be left for several days waiting to be pressed, allowing the fruit to start fermenting, affecting the flavour and producing chemicals. The oil from fermented olives needs to go through a process using chemicals, heat, pressure and filtering to be fit for human consumption. This removes many of the beneficial phytochemicals found in EVOO, which also reduces the health benefits. Fortunately, there are now Australian Standards and testing procedures to ensure quality, and over 95% of the olive oil produced here is extra virgin. In addition, many Australian producers have a short processing time from harvesting the olives to turning them into olive oil, which is crucial to producing high-quality oil. Those EVOOs that pass the test will have a small certification triangle on the label, so an easy way to ensure that you get the best quality EVOO is to choose an Australian band with the symbol. The best choice is a cold pressed, Australian brand in a dark bottle that has the certification triangle on the label. They do cost more, but in the case of EVOO, you are more likely to get what you pay for. This will give you peace of mind that you are consuming a quality product with amazing health benefits for you and your family. 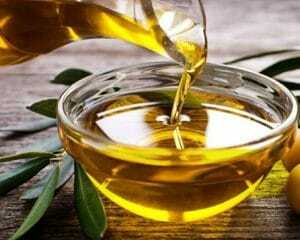 You may also be interested in reading our article on Good Fats. Like what you see and wish your company could take part in Ritualize? Ritualize is a leading provider of corporate health and wellbeing programs across Asia Pacific, Europe and North America. Our unique approach creates compelling calls to action which deliver tangible benefits to our customers and partners.